The terms debit & credit refer to left and right sides of the general ledger account and both are commonly abbreviated as Dr. for debit and Cr. for credit. Note that debit & credit do not mean increase or decrease. The act of entering an amount on the left side of the account is called debiting the account, while posting an amount on the right side of the account is known as crediting the account. Note that the amounts on the left side (debit) and on the right side (credit) must equal to each other, otherwise the accounts will not balance. The system of debits & credits provides the basis for double-entry account system of recording financial events & transactions (this is sometimes referred to as double-entry bookkeeping). In every transaction, the total of all debits must equal the sum of all credits; this case applies when multiple accounts are affected on the accounting journal. 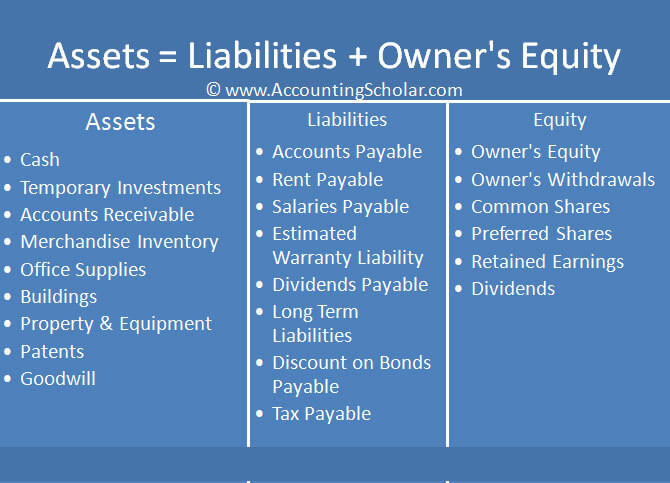 The diagram below shows examples of Asset, liability & equity accounts in graphical format. Assets are the economic resources that an organization controls and that will provide current & future benefits to the company. All assets have value and are used in the operations of a business and their main purpose is to generate revenues or cash flows for the organization. For instance, a company that owns 200 computers used by its employees will classify this as an asset because they are used in the operations of the business and used to generate revenue; they would be recorded as a Capital asset on the balance sheet. Below, we go over some of the most common asset accounts found in most companies’ balance sheets. Increases & decreases in the amount of cash every day is recorded in a ‘Cash’ or ‘Bank’ account. Accepted cash includes money including coins, cheques, money orders & checking account balances. Most large organizations have several cash accounts with different banks and usually employ Bank accountants to keep track of banking transactions. i) Accounts Receivable – When goods are sold to customers or service is performed and the customer promises to pay in the future, this gives rise to an entry to Accounts Receivable. Accounts receivable is increased by services performed or goods sold on credit (Debit) and decreased when a customer makes payment (credit). ii) Notes Receivable – A note receivable, also known as a promissory note is an unconditional promise to pay a specified sum of money in the future on a specific date. The company that is expecting to receive this promised sum of money will record a note receivable asset on its balance sheet. Prepaid expense is an asset account containing payments that are made now but for services that will be received or will be used in the future. As these assets are used up, the costs of this usage becomes expenses. The 3 most common types of prepaid expenses are Office supplies, Store supplies & prepaid insurance. Other types of prepaids include prepaid rent, advance payments, etc. i) Office Supplies –Large organizations use a lot of office supplies such as stationery, paper & pens. These supplies stay as assets until they are used up. When they are used up, their cost is reported as an expense. The cost of unused supplies remains an asset and is recorded in an Office Supplies account. ii) Store Supplies – Most large retail organizations keep supplies for packaging purchased goods for customers. For instance when you stand at the check counter at Costco, they put your purchased goods in bags that are free. Costco would thus record the cost of these bags in a Store supplies account. The cost of unused supplies stays as an asset in the Store supplies account and as they are used up, an expense is recorded. iii) Prepaid Insurance – Most insurance companies like their premiums to be paid in advance. The fee is known as a premium and covers the company against unfortunate losses such as fire, theft, accidents and so on. When insurance premiums are paid in advance, the cost is recorded to an asset account known as Prepaid Insurance. Over time as the prepaid policy is used up, the associated cost is recorded as an expense on the income statement. The unexpired portion of the insurance policy remains in the prepaid insurance account & is reported on the balance sheet. Most large companies own lots of equipment including computers, chairs, office desks, printers, books, scanners, etc. The costs incurred to buy this equipment are recorded in an Office Equipment account on the balance sheet. The costs of assets used in stores such as showcases, displays, cash stands & registers or counters are recorded in a Store Equipment account. Buildings owned by a corporation provide space for warehouse & factory operations and allows employees to support the front line employees of the organization by working in those buildings. The cost of acquiring & owning a building is recorded in a Buildings asset account. When several buildings are owned, separate accounts are used for each of them. The land account records the cost of land owned by a business and is separated from the buildings account to provide more relevant information to viewers of their financial statements. Accounts payable are promises by a business to pay for a good or service later. Typical goods purchased on credit include merchandise, equipment, supplies, stationery, etc. When a corporation formally signs a promissory note to pay a specified sum of money in the future, this becomes known as a note payable. Notes payable can be classified as a short term note payable or a long term note payable depending upon when it must be repaid. If the note is due in 1 year or less, it is a short term payable, however if the note is due after 1 year or more, then it becomes a long term note payable. Unearned revenue is when cash payments from customers is received in advance of actually providing the service or selling the goods. Because cash is received from these transactions before actual revenue is earned (service is performed), this revenue must be recorded in an Unearned Revenue account. Unearned revenue is a liability that is satisfied or ‘earned’ by delivering the products/services in the future. Examples of unearned revenue include sales of gift certificates by stores, airline tickets sold in advance, prepaid rent collected in advance, etc. When cash is received in advance for products/services, the seller would record it in a liability account such as Unearned Ticket Revenue, Unearned Professional Fees or Unearned Advance Subscriptions. When the products / services are delivered to the buyer, the earned portion of this revenue is transferred to revenue account such as Subscription fees, Rent revenue or Professional fees.